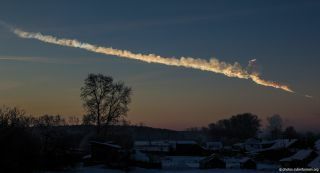 Trail of the asteroid that exploded over Chelyabinsk, Russia, on Feb. 15, 2013. "And unlike other potentially global-scale catastrophic events, the solution is nearly purely a technical one, and with a relatively small and known cost," Lu added. "So as my friend, former Apollo 9 astronaut and co-founder of the B612 Foundation Rusty Schweickart says, 'Let’s get on with it.'"